At first glance, these two words don’t seem to go together. However, some of the best sushi in the world can be had in Las Vegas. Whether you’re looking to splurge after killing it at the tables or searching for a unique experience, let me guide you to an unforgettable destination. 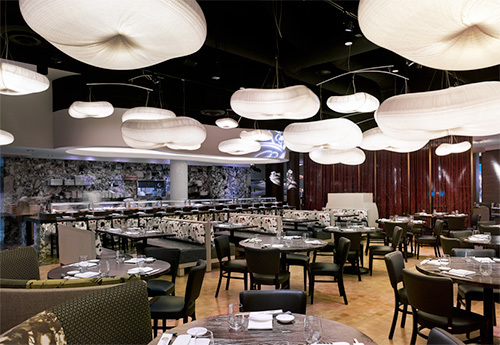 Located near the lobby of the ARIA in Las Vegas, barMASA is a 1-Michelin Star counterpart to MASA in New York. 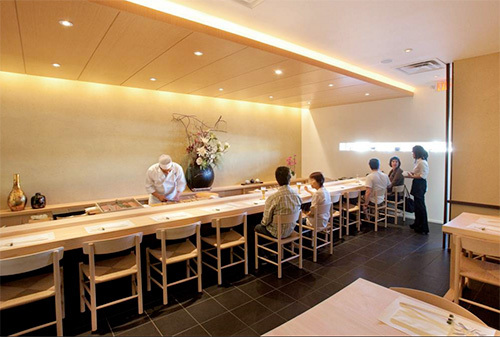 This spot offers meticulously prepared traditional and modern japanese dishes with Michelin-standards. A modern and minimalist decor is coupled to dishes that highlight a single, primary ingredient. Do not come here to drown nigiri in soy sauce. You will be looked down upon. The Must Have: The signature roll Masa Toro Toro. It’s filled with wild bluefin toro, sourced directly from Japanese coastal waters, Tokyo Negi onions, and fresh wasabi. The Plus: The largest selection of sake in Vegas. Traditionally prepared sushi comes to Vegas. With only ten seats at the bar and another ten in the whole restaurant, this is one of the most intimate chef to guest experiences available in the world. However, reservations do need to made in advance. At Kabuto, your food comes directly from the chef’s hands to be consumed only moments later. The Edomae experience is one of freshness and intimacy of service. If you want California rolls in a loud hip interior, please go somewhere else. 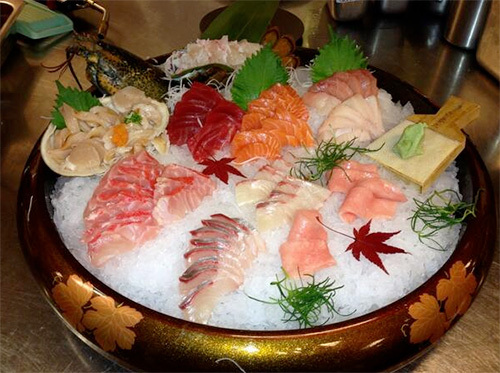 The Must Have: Omakase, a meal consisting of dishes selected by the chef. Find a place near the bar and let the flavors overwhelm your palate. The Plus: The experience of having a sushi master chef craft your meal. A world-renowned chef and a series of decorated restaurants. 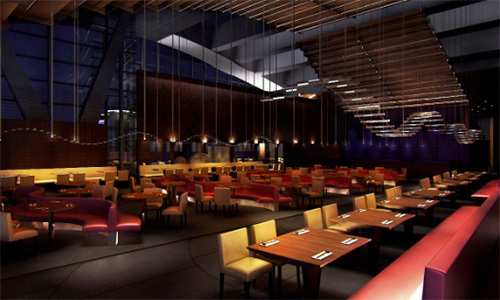 Chef Nobu Matsuhisa selected Caesars Palace as the spot to open the largest Nobu in the world. But it’s more than just a restaurant. It’s a hotel within a hotel and the only one in the United States with teppan tables for a true Japanese steakhouse experience. Be prepared to lose your upscale sushi virginity here. The seduction starts from the outside, with columns of bamboo that line the exterior, to the inside where every dish is a work of art. 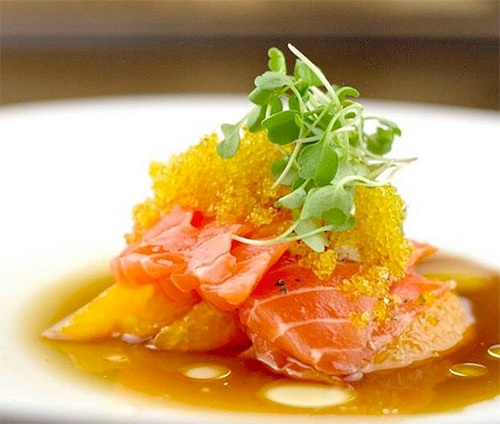 At Nobu, expect the exquisite. The Must Have: Black Cod Miso, Rock Shrimp Tempura and Yellowtail Sashimi with Jalapeño and Squid Pasta. The Plus: Imported A5 Japanese Wagyu. What do snowboarding and sushi have in common? In this case, Akira Back. A snowboarding pro who worked with Masaharu Morimoto, Brian Nagao and Nobu Matsuhisa before opening his own restaurant. He even has his own line of sake. It won’t help with your snowboarding skills though. highest quality seasonal fish and ingredients are joined to create culinary masterpieces. Which is all just fancy language for damn good sushi. 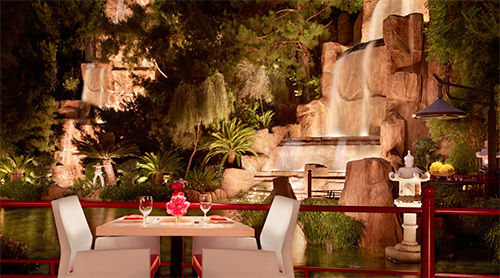 And if that isn’t enough, reserve a seat at the outdoor veranda that features breathtaking views of the Las Vegas Strip and the Bellagio’s iconic fountain show. The Must Have: Big Eye Tuna Pizza. Where else will you ever get to order that again? The Plus: An exotic sake list that includes Frozen Beauty Sake, Las Vegas’ most expensive sake priced at $2,400. Get it when someone with an expense account is footing the bill. A 90 foot tall waterfall that splashes down amidst a koi pond. A true feast for the eyes. But it doesn’t just end there. At Mizumi, variety is the spice of life. Chef Devin Hashimoto offers a delectable dining experience: ocean-fresh sushi and sashimi, a robatayaki bar and a teppanyaki room. This is modern Japanese cuisine with exquisite execution. Mizumi is also one of only three restaurants in the United States that offer certified authentic Kobe beef. The Must Have: Their signature dessert dish: Mizumi Chocolate Mask. If you’ve ever wanted to eat a work of art, this is your chance. The Plus: The pagoda next to the waterfall. It will make your social media game stand out. Not your regular Sushi place. Pay close attention to the word ‘Modern’ in the name. It’s there for a reason. Yonaka Modern Japanese is a modern dining room with a selection of Japanese cuisine served tapas-style. Here, you’ll find some of the most creative sushi presentations you’ve ever seen. If you’re looking for a memorable dining experience, you can’t go wrong with Yonaka. They blend traditional Japanese ingredients with international flavors and inspirations. The Must Have: Order the Fat Duck. A culinary delight with crispy foie gras, eel, Gruyère, bacon, and avocado. The Plus: Brussel sprouts. Yes. The brussel sprouts. Trust me. While the desert may yearn for water, that doesn’t mean you have to do without sushi. Whether you’re a tourist or a local, Las Vegas is a delectable destination.